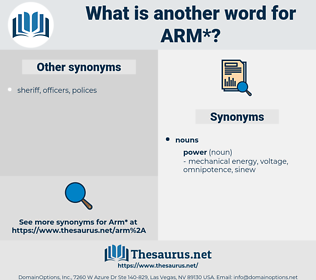 What is another word for arm? arming, forearm, armpit, arms, armrest, Firearms, leg, sidearm. Institutes, wing, lever, component, body, elbow, MRA, limb, organ, instrument, strand, pillar, embrace. dissuade, keep, forget, discourage, take, hurt, neglect, Unfurnish, weaken, injure, unclothe. Little Ann put her hand on his arm. He took the fellow by the arm. 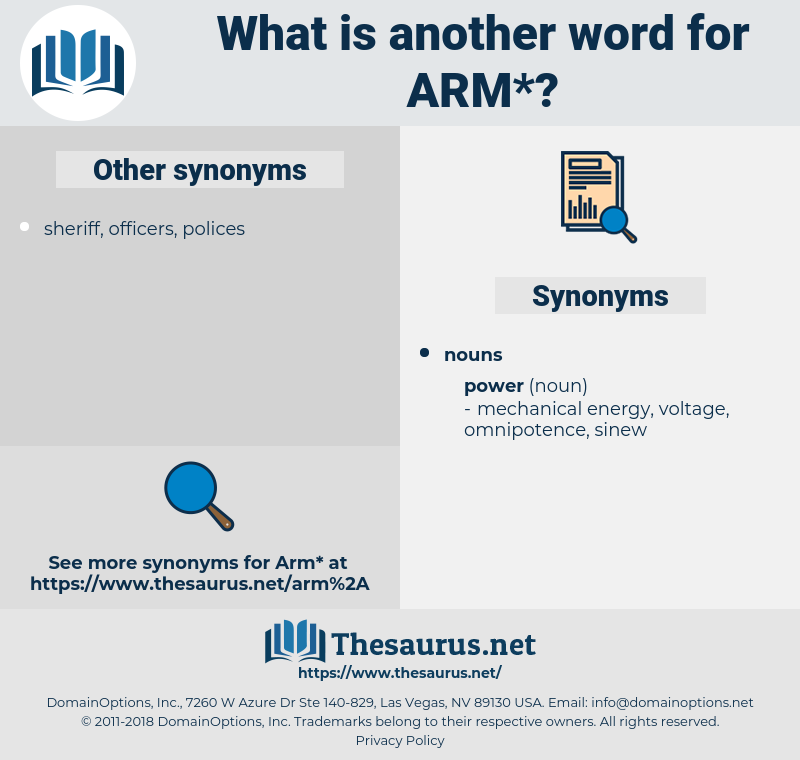 arame, Arnhem, airman, airwoman, arminian, aurorean, ariomma, aroma, aram, araneae, army, arena, arrow arum, aaron, aramaean, Ariana, arum, armin, aryan, arno, arrowworm, armenian, air horn, aranea, aramean, ahriman, armenia, arawn. human, body, man, homo, organic structure, human being. Radiocarpal Joint, Arteria Brachialis, Musculus Biceps Brachii, wrist joint, humerus, cephalic vein, Biceps Humeri, Articulatio Radiocarpea, Triceps Brachii, elbow joint, hand, cubitus, Articulatio Cubiti, manus, wrist, Cubital Nerve, ulnar nerve, Cubital Joint, paw, Nervus Ulnaris, mitt, Musculus Triceps Brachii, carpus, Biceps Brachii, Vena Cephalica, elbow, forearm, human elbow, arm bone, brachial artery.